As part of our great book giveaway, the authors of “Baking By Hand” (get it here) have given me permission to include the following recipe for you to use. The instructions given make use of no mixer; it is, as the book title indicates, all done by hand. You’ll also use a process called “autolyse” to hydrate the flour by letting it sit after mixing, then a “stretch and fold” after 30 minutes of proofing which bypasses the need to knead the dough. 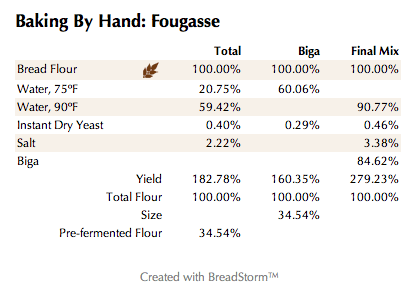 Also note that all ingredients are given in weights, not volumes (cups), save for salt & yeast. If you need a scale, please read this post. This recipe is found on page 98 of Baking By Hand. Fougasse is Provence’s answer to the Roman-born Focaccia. Their names both come from the Latin root word focus, meaning “hearth,” and they’re both flattened doughs that feature toppings or folded-in ingredients. The distinctive feature of the fougasse are its decorative holes cut into the dough’s surface, which are really up to the baker’s whim. You’ve got three flavor variations to choose from here, or you can leave the bread plain or come up with your own tasty additions. If making olive fougasse, the bread will come out a teeny bit bigger, but that’s fine. Mix and let sit, covered, 12 hours. Sprinkle the salt and yeast on top of the dough, which will have developed a good deal of strength by now. Grab a four-finger pinch of the dough and pull. It should stretch out like chunky taffy rather than just tear off. Incorporate the salt and yeast into the dough while continuously pushing the sides of the dough into the middle while turning the bowl. After a minute of this, the dough should be pulling away from the sides of the bowl and developing a bit of a sheen, and you shouldn’t feel any crunchy salt crystals (add your olives at this point if you’re making Olive Fougasse). This dough will be significantly looser, or wetter, than other dough recipes in this book. Cover the bowl, and put it in your warm place for 30 minutes. (Here comes the Stretch and Fold!) Turn your dough onto a lightly floured surface and give it your four-fold by gently patting it out, folding the left side into the middle, the right side overlapping the left, the top into the middle, and finally the bottom overlapping the top. It should make a tight little package – this is how we’re building the dough’s strength, and after every fold the dough’s volume should increase. It should consistently feel warm and active. Roll the dough over and place it, seam side down, back into the bowl. Repeat every 30 minutes (you’ll fold the dough four times in total). After the fourth fold, leave the dough alone to develop volume for the last hour; those bubbles are what will make up the nice open crumb of your fougasse. You’re looking for the dough to be strong but puffy, warm to the touch, and able to hold a fingerprint when pressed into the surface. The whole process will take about 3 hours with a warm kitchen and warm dough. When the dough is ready to divide, turn it out onto a well-floured work surface – this dough is a bit sticky, so some extra flour is necessary here. Divide it into four 1 lb pieces, and gently pre-shape each one into a round. Let these pieces rest, covered with a cloth, for at least 1 hour. While your dough is proofing, place your baking stone on the lowest rack in your oven, and your cast-iron pan on the highest rack. Preheat the oven to 450ºF (232ºC) . When the dough is totally relaxed and you can press your finger into the surface and the print holds, you’re ready to top and bake them. 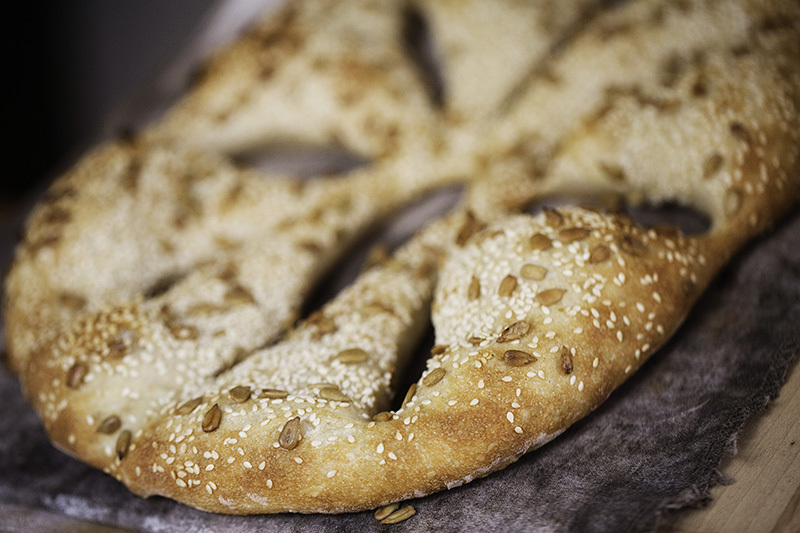 It’s easiest to top your fougasse right on the peel, so you can easily slide them on to your baking stone. If you’re concerned about toppings dropping into the oven, line the peel with parchment paper and shape the fougasse on top of that. While the dough is still on the table, pat a loaf out until it is almost completely flat, then transfer it to the peel. Finish patting out until completely flat. If making Cheese Fougasse, spray your fougasse with water and sprinkle your cheese on top of the loaf, about 1/4 cup per loaf. If making Seeded Fougasse, spray your fougasse with water and sprinkle an even layer of seeds on top of the loaf, about 1/4 cup per loaf. Top with a pinch of salt. Grab your pizza wheel, and cut a pattern of slits into the surface of your dough and spread out evenly with your fingers. There are no shortage of traditional fougasse patterns, but we’re big on dedicating a pattern to a flavor and keeping it consistent. Now grab three ice cubes from the freezer. Being careful not to keep the oven door open too long and let the heat out, open the oven, slide your fougasse onto the stone, throw the three ice cubes into the cast-iron pan, and close the door. A second spritzing of water into the oven is not necessary unless you’re making plain fougasse, as the toppings will keep the surface moist. Bake for about 25 minutes, or until the sides of the crust are golden brown and the toppings have a nice, roasted color (depending on the topping). Eat immediately, or when your mouth can handle the heat. 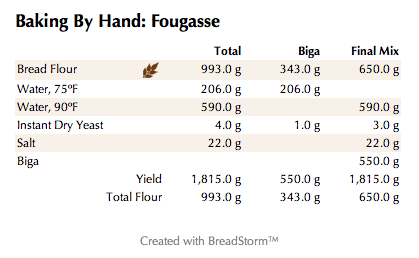 For those of you who are using BreadStorm Bread Formula Software for the Mac (including the free version), please click on this link to download the formula so you can scale it up or down as desired.